Hair means a lot of things to a lot of people. It is considered a sign of vitality and youth for men and a crowning glory for women. Whether you are a man or woman, losing your hair could be a source of insecurity. Even the slightest notice of hair loss could lead to a decline in one’s self-esteem. However, there are many natural remedies for the treatment of hair loss in addition to products like Rogaine and other prescription medications. One of such natural remedies is by eating pumpkin seeds. Research shows that pumpkin seeds eaten raw are effective in the treatment of hair loss. Pumpkin seeds, with scientific name Cucurbita Maxima or Cucurbita Pepo, were discovered way back in 7,000 B.C. by a Mexican Archaeologists. Traditionally, pumpkin seeds were used to combat urinary, prostate, as well as infections caused by tapeworms. They contain essential minerals like copper, magnesium, zinc, manganese, and Phosphorus. They are also rich in antioxidants and vitamins like A, B, E, K. Plus; they contain enough proportion of potassium and sodium. So, if you are struggling with hair loss; before you throw in the towel, give pumpkin seeds a chance to help you combat your hair loss problem head-on. 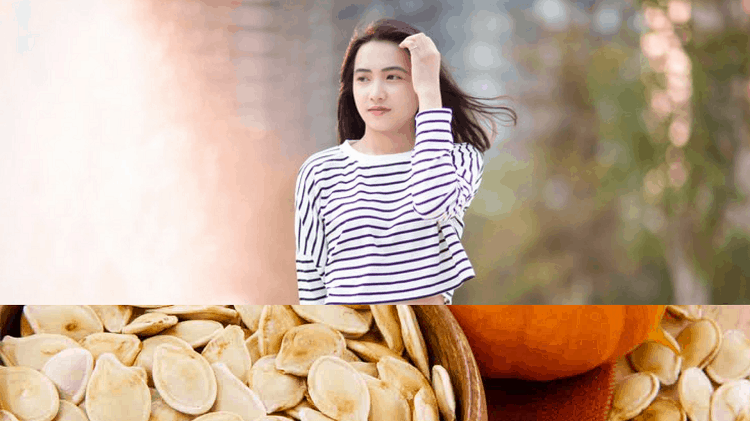 Pumpkin seeds are nutritional powerhouses that not only offer a host of benefits for the treatment of hair but can also provide a useful solution to skin and other health challenges. In this article, we’ll take a look at pumpkin seeds benefits for hair. Without further ado, let’s get started. So many reasons are responsible for hair loss both in men and women. Some of the reasons are long-term illnesses, poor health, stress, genetics, and hormonal imbalances. What’s more? Deficiency in essential nutrients can also lead to non-productive scalp or hair loss. The oil from Pumpkin seeds is widely believed to affect androgen and testosterone levels in the body. Whether you’re keen on fighting hair loss or you simply want to grow hair that is not only fuller but thicker, consider including pumpkin seeds in your daily diet. Consume a handful of raw, sprouted or roasted pumpkin seeds daily. Alternatively, you could also massage your scalp and hair with the oil, leave it overnight, and then wash it off in the morning. A study suggests that pumpkin seeds are a rich source of iron and L-lysine – two vital nutrients that are widely believed to cure excessive hair shedding. If you consume these nutrients in the right proportion, it will help enhance your hair growth and thus restore it back to its former glory. Any time you experience side effect like allergic reaction when you eat raw pumpkin seeds, consult your doctor for professional advice. Ensure you eat only fresh pumpkin seeds and chew the seeds well before ingesting. Another significant pumpkin seeds benefits for hair is the prevention of dandruff. They are a rich source of zinc; a major ingredient used to produce anti-dandruff shampoos. Thankfully, if you consume pumpkin seed, you won’t have to stress yourself applying shampoo on your hair. Eat a lot of raw, sprouted or roasted pumpkin seeds daily. On the other hand, you could also massage your scalp and hair with the oil, leave it overnight, and then wash it off in the morning. 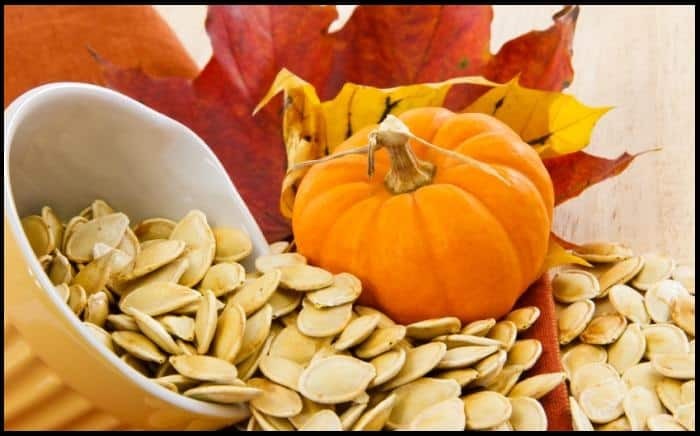 A study carried out by the Dermatology Research, and Practice suggests that owing to the anti-fungal properties of zinc, pumpkin seeds are effective in the treatment of irritation, flaking, as well as itching linked with seborrheic dermatitis. If your hair is free from dandruff and you don’t suffer hair loss, eating pumpkin seeds is your best bet if you want to keep your hair healthy. Do you admire the hair of those celebrities you see on the TV? Yours won’t be an exception if you eat pumpkin seeds. Eat a lot of raw, germinated or roasted pumpkin seeds every day. On the other hand, you could also massage your scalp and hair with the oil, allow it to stay overnight, and then wash it off in the morning. Another study found out that pumpkin seeds are rich in nutrients like protein, iron, Omega-6 fatty acids, and zinc. These nutrients are essential for your scalp and overall hair health. Pumpkin seeds are available over the counter on major grocery stores as well as convenient and health food stores. Including them in your shopping list would be a no-brainer. In fact, you can even buy them raw, dried, salted, shelled or roasted. The choice depends on you. Alternatively, you can go for pumpkin seeds oil. The oil has a strong flavor; hence, mixing it with other oils will improve the taste. If you don’t want to eat pumpkin seeds raw, you have the option of tossing them into your salad or sprinkling them in your bread for added fiber. Or you can even add them to your soup to give it a nutty flavor. If you want to use pumpkin seeds for hair growth, don’t expect visible results immediately. It can take anywhere between 4 to 6 months before you experience any effects. Remember, for you to improve your hair growth, patience is the key. Previous articleDoes Ketoconazole Stop Hair Loss? Next articleDry Scalp Vs Lice – What’s the Difference?